Stig Helmer (Ernst-Hugo Järegård) is the chief consultant neurosurgeon at the Kingdom hospital in Denmark. He has just transferred from Sweden, having gotten into some trouble for plagiarism, and is plagued with a recent mishap that led to a girl he was operating on suffering severe brain damage. 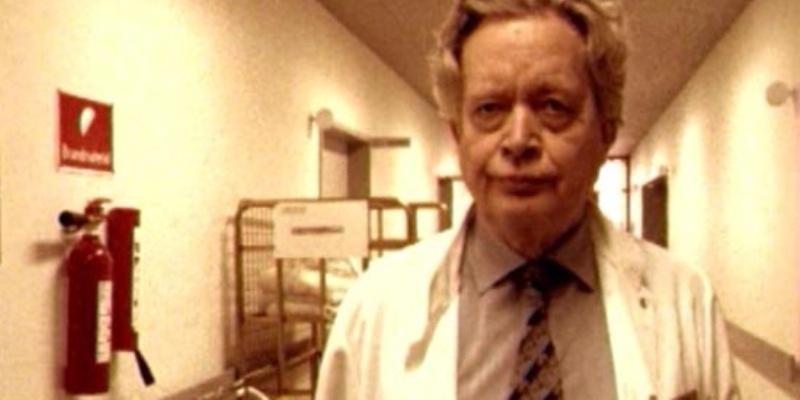 Helmer has various problems to deal with at the hospital, including junior registrar Hook (Søren Pilmark), who lives in the basement performing various errands and making ends meet for everyone in the hospital, whilst gathering potential blackmail information on everyone in any place of power. 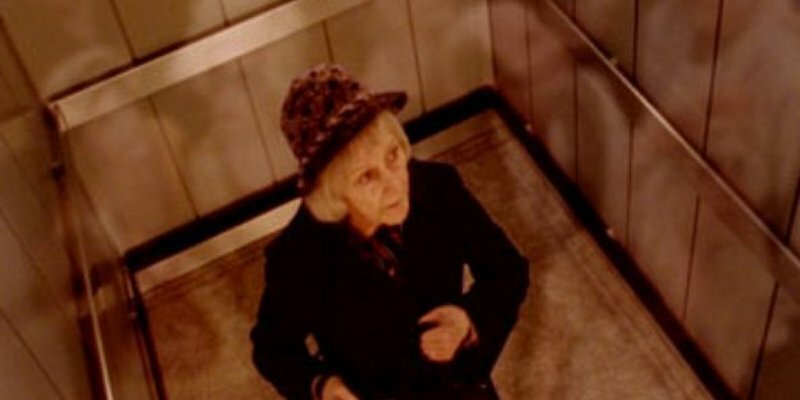 There’s also Mrs. Drusse (Kirsten Rolffes) a recurring patient with a fixation on the occult, and Moesgaard (Holger Juul Hansen), Helmer’s boss, who is midway through a new initiative to increase morale at the hospital, and continually pesters Helmer to join the hospital’s elite lodge. There’s also the ghost of a little girl and a dog, a phantom ambulance, a pregnancy that increases at a worryingly rapid rate, a surgeon trying to convince the family of a dying patient to donate his liver that contains a rare affliction, some business with a severed head, Haitian zombies and two dish washers who seem to know a great deal more about what’s going on than anyone else. Directed by Lars von Trier, The Kingdom was originally released as an 8-episode television series for Danish TV, but was re-edited to form a single film for other audiences. Somehow, that “single film” I watched was still split into four “episodes,” each of which is between 60 and 80 minutes long, and has a full opening title sequence, prologue and cheesy 90’s opening credits. You know, the kind where they show the actor’s face from a clip of the show when their name flashes up. There’s also an extremely odd end credits sequence each time, in which Lars von Trier himself appears and talks directly to the audience, commenting on what happened in that episode, piques the interest of the next one and remarks on what your opinions might be on it, before making the devil horns at everyone. It’s most bizarre. Aside from my obvious distaste at the list-compilers feeling that for some reason it’s OK to put a TV series on a list of the 1001 MOVIES You Must See Before You Die (they did the same thing with Decalogue), for the most part I quite enjoyed this. There’s interesting characters, well thought out situations, ethical dilemmas and a darkly comedic flair. And it involves horror, but is never actually scary, which is always a plus for me. There’s some great stuff in the second half especially, with three sets of characters all trying to secretly access the hospital’s archives for various reasons, all simultaneously, and a surprise inspection occurring at literally the worst possible time, with every single other named character in the middle of some underhand, ridiculous or downright illegal activities, and all getting found out at the same time. Plus there’s some really unforgettable imagery that I can’t go into without spoiling anything, but rest assured I’ll never look at Udo Kier the same way again. However, and this is a pretty damn huge however, the fact that this is part of a TV series meant that it went on to create more product. There was a second series three years later in 1997, and a third planned but abandoned after several of the cast members passed away. In order to keep the audience’s interest for a second season, several cliffhangers were included. And when I say several, what I mean of course is that every single plot line, of which there are several, has not reached anything close to a satisfying conclusion come the end of part four of this so-called-movie. I do despise endings that are overly open-ended, and this is the most ambiguous I’ve ever come across, which is endlessly frustrating. The final “episode” raises far more questions than it provides answers, and I hear the same can be said of the second series. The image quality is also pretty terrible. I think it is supposed to be, with a sepia, grainy aesthetic that adds a creepy air to most parts but just feels very cheaply made at times. Also, and this is very much a personal gripe, but with this being a medical drama there were several moments that I’d normally look away from, due to being a bit squeamish at surgery scenes. However, the damn thing is subtitled, so I couldn’t look away else I’d not have understood what was being said. Very annoying! As much as I enjoyed the majority of the plot, characters and comedy, I can’t recommend something that I know never provides any kinds of answers. It’s the same problem I have with Richard Linklater’s Before trilogy, as I know it never concludes, it’s always leading up to the next chapter. As such, I cannot recommend this. This entry was posted in 07/10, 1001, Choose Life, Review, The List and tagged Lars Von Trier, The Kingdom, Udo Kier by jaycluitt. Bookmark the permalink. That was the problem I had with this, too. I like where it goes when it’s going, but it never really gets anywhere. It was all going so well, and then towards the middle of the fourth “episode” I began to realise there was far too much to wrap it all up in the next 30 minutes. Such a pity. I enjoyed the hell out of that series yet I was so disappointed by the fact that it left so many questions when it ended and for the fact that several people in that series are now gone. I get the feeling this would be like the Before movies anyway, in that even if they made a third season they wouldn’t wrap most of it up, leaving it open for a fourth and so on. I find that kind of thing very frustrating. I have the same problem with why the hell a TV miniseries makes a list of movies purely because it has a name director behind it. In my case, unlike The Decalogue, The Kingdom did not overcome this because 4 1/2 hours of heavy shakycam is it’s own special brand of hell for me. I didn’t much care how it ended with open questions; I was just glad it ended and I could check it off as having been seen. Fair enough. I don’t have a problem with the shaky-cam, I was more bothered by the terrible visual quality of the footage. Nothing needs to be grainy for the sake of it other than flashbacks to traumatic events during court scenes.